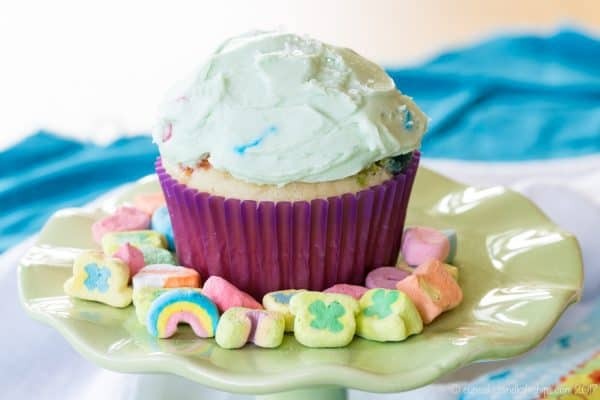 Lucky Charms Cupcakes are a fun St. Patrick’s Day cupcake recipe or for any day you want a colorful treat made with your favorite breakfast cereal. 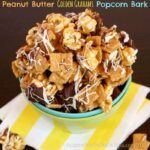 This dessert recipe will make kids of all ages happy, and there are from scratch and cake mix options. Or check out the directions to make gluten free cupcakes as part of a gluten free St. Patrick’s Day. And you can’t forget the simple marshmallow-studded buttercream frosting on top. Paraphrasing the Grinch, I got an idea. An awful idea. A wonderful, awful idea. I have three words for you. Yes, I said it. 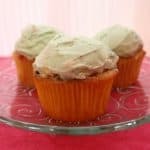 Somehow when thinking about a St. Patrick’s Day dessert, I came up with cupcakes based on an American breakfast cereal. How Irish! And how strange of me since usually I’m giving my kids plain Cheerios for breakfast, or adding cereal to healthier snacks like Cereal and Yogurt Stuffed Apples. So let me tell you a little story. As a kid, the rule was that I could not buy any cereal that had marshmallows in it. Mind you, I could have all of the sugar-coated cereal I wanted I wanted, and our house was never short on M&M’s or Chips Ahoy! cookies. And she does advocate an occasional dinner of ice cream. But marshmallows in my breakfast cereal? NO WAY! So what did I do every time I slept over my cousin’s house? In the morning, I immediately bee-lined for the Lucky Charms or Franken-Berry or Boo-Berry. Unfortunately, my cousin usually beat me to the toy surprise. I am not sure if this recipe is in defiance of or homage to my mom marshmallow rules. 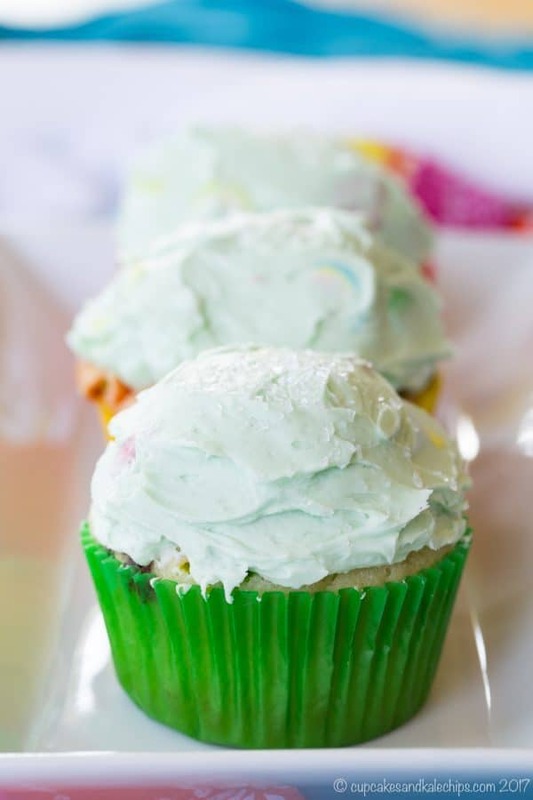 But I just had to make Lucky Charms Cupcakes, and you do too! So as I thought about this some more, I knew I was going to go all Momofuku on these bad boys. I am talking about Cereal Milk! If you haven’t heard of it, Momofuku Milk Bar is a restaurant/bakery in New York City, where they use “cereal milk” in some of their baked goods. So I had to try the idea out for myself. Because isn’t that one of the best parts of eating a bowl of sugary cereal – drinking all of the yummy, sweet milk at the end?! From my early days of learning to bake from The Cake Mix Doctor, I will advocate for homemade buttercream frosting. It’s so simple and so worth it. And it’s super fun when you stir in Lucky Charms marshmallows. If you are big on piping frosting, pipe it on then top with marshmallows, but I like the little peek of color you get from folding them in, though that does make the frosting un-pipeable. Just dollop it on! 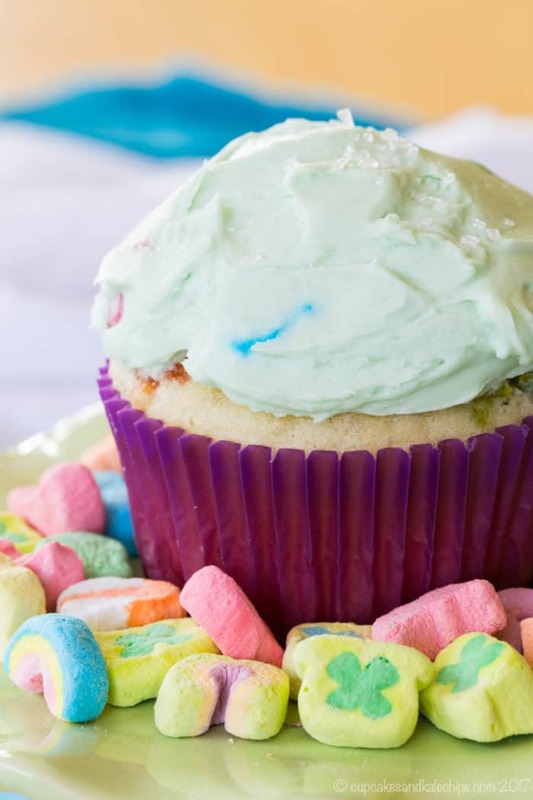 Can you make Lucky Charms Cupcakes with a cake mix? 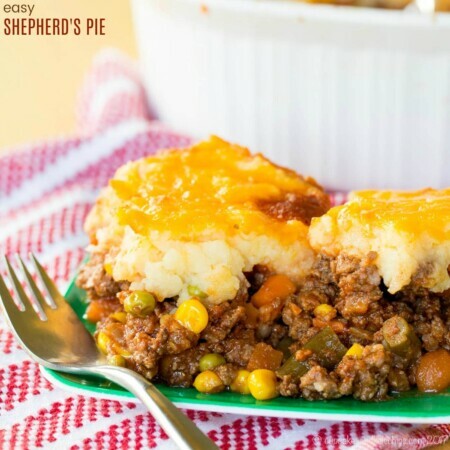 Originally I only posted this recipe with the from scratch version. But over the years I’ve come to a realization after spending way too many hours making cupcakes from scratch – the kids you usually feed them to don’t notice and certainly don’t care whether you sifted flour and carefully combined wet and dry ingredients or just opened up a pouch. So yes, you can use a cake mix. But whether you use the scratch cupcake recipe or the box mix (or even gluten free cake mix), you get a little extra cereal-licious flavor from the cereal milk. That means you’ll start the same way, by separating the marshmallows form the cereal and soaking the cereal in the milk. Then use the milk in place of the water in the cake mix. 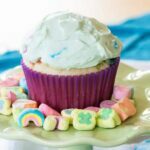 Can you make gluten free Lucky Charms Cupcakes? Lucky Charms are a gluten free cereal. Therefore, if you use two boxes of gluten free cake mix, you can make 24 gluten free cupcakes using the Lucky Charms cereal milk and marshmallows. The buttercream is already gluten free, so you won’t need to make any changes there. And you’ll love these 15 Rainbow Sweets and Treats That’ll Make Everyone Go Crazy! What else can you make with Lucky Charms? My friends have also made some Lucky Charms treats. A Lucky Charms Blizzard from Wishes and Dishes is a perfect way to cool off. Lucky Charms Marshmallow Treats from Brown-Eyed Baker are double the marshmallowy goodness. 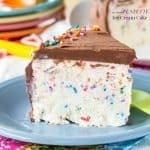 And then there’s No-Bake Lucky Charms Cheesecake from Spend with Pennies for a creamy, dreamy delight. Can you buy Lucky Charms marshmallows? Yes, this recipe does involve opening a box of Lucky Charms and picking out all of the marshmallows. But you can always soak the cereal and marshmallow combo in the milk to make the cereal milk, then just buy these from Amazon. Everyone will go crazy for these colorful cupcakes. 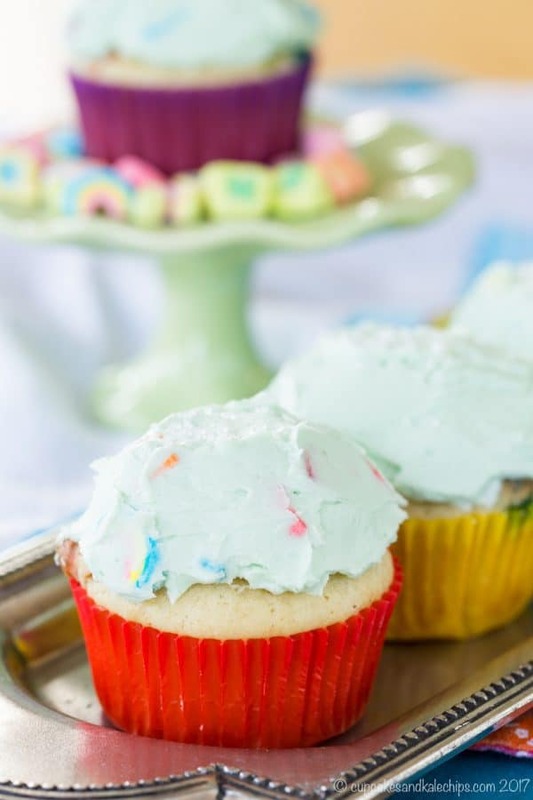 Flavored with Lucky Charms cereal milk, filled with marshmallows and covered in a marshmallow-studded buttercream, this is a fun sweet treat. Perfect for St. Patrick’s Day, a birthday party, or for the cereal lover in your life. And you can make them from scratch or using a regular or gluten free cake mix. P.S. This video shows the basic cake mix version. 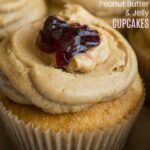 The recipe below gives from scratch and gluten free cupcakes. Preheat your oven to 350°F, and put liners in cupcake tins. Pick the marshmallows out of the box of Lucky Charms. Set aside the marshmallows to fold into the batter and frosting. Combine 1 cup of the Lucky Charms (after removing the marshmallows), the milk and vanilla extract. Let soak while you finish assembling the other ingredients, about 15-20 minutes. Grind 1 cup of the Lucky Charms (after removing the marshmallows) into a powder using a food processor, or just crushing them up really well. You should be left with a little less than half a cup of cereal powder. Sift together the cereal powder, flour, baking powder, and salt into a bowl. In a large bowl, cream the butter, then gradually add the sugar, creaming until light and fluffy. Drain the milk mixture off of the cereal. To the butter and sugar, alternate adding the flour mixture and the milk mixture in thirds, beating until smooth after each addition. Fold 1 c of the reserved marshmallows into the batter. Divide the batter evenly among the cupcake tins. Bake for 20-25 minutes, or until it springs back when you touch it. Preheat your oven to 350°F or as directed in the package instructions, and put liners in cupcake tins. Combine 1 cup of the Lucky Charms cereal pieces and the milk. Let soak for about 15-20 minutes. Then drain the milk mixture off of the cereal. Add enough milk to equal the total amount required for the mix (some may get absorbed by the cereal while soaking). Prepare the cupcake batter as per the package instructions, using the cereal milk in place of the water. Fold 1 cup of the reserved marshmallows into the batter. Divide the batter evenly among the cupcake tins. Bake according to package instructions. With a mixer on medium-high, beat the butter in a large bowl until light and fluffy. Reduce the speed to medium, and gradually beat in the sugar. Continue mixing for a few minutes, until the frosting is smooth and creamy. Add the vanilla and food coloring, if using, and beat until smooth. Carefully fold in the marshmallows. Originally published on March 11, 2012. Updated on March 14, 2017. 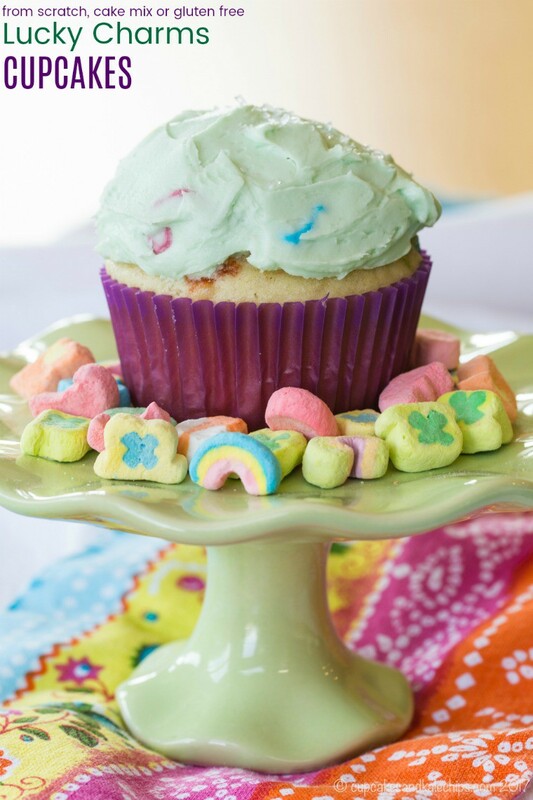 Here are the original photos of Lucky Charms Cupcakes! I would normally try and make everything from the scratch because that’s somehow healthier, but then I realized – you are about to make Lucky Charm cupcakes! Come ON! Live a little! :D…and chose the faster version. I don’t see the scratch version. I’m on my phone and may be missing it somehow? Also, can this be used as a cake instead of cupcakes? 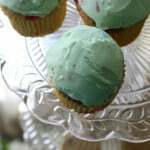 Do you have any photos of inside of the cupcakes once baked? I saw Tosi on Once Upon A Chef and loved the idea for my 3 yr old’s birthday cake. Hi! The scratch recipe is just above the cake mix recipe. I have not tried it as a cake, but I don’t see why it wouldn’t work. I just can’t confirm that. I don’t have photos of the inside, sorry. But if you make them let me know how it turns out. 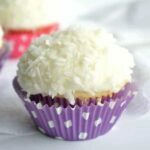 I am looking for some cupcake recipe for my nieces birthday, and your idea seems delicious. I just wonder if I can add some mint leaves to buttercream frosting for fresh? I think the flavor is nice, and there is no need to use food coloring as well because the leaves juice themselves are green. 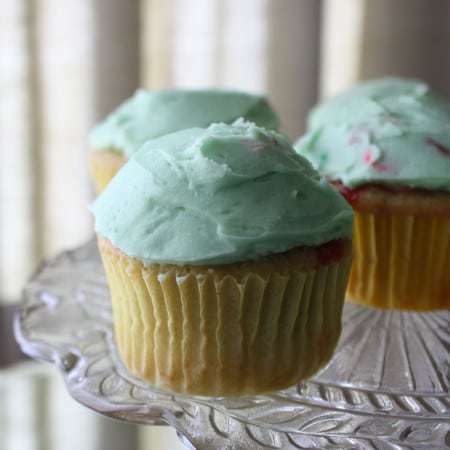 I actually didn’t make a mint frosting, I just wanted a touch of color so only used a drop in the whole batch, but perhaps the mint would work. Although I just saw that McCormick (http://amzn.to/2nCY2dj) and Watkins (http://amzn.to/2nrSXUG) are both now making natural food colors (affiliate links). I love these so much. I made them for my sister-in-law’s birthday over the weekend. So good. Added a little bit of cream cheese to the frosting just because. I like how the frosting can turn the marshmallows soft (like marshmallows instead of styrofoam). Don’t get me wrong, I like the Lucky Charm styrofoam texture, it was just surprising to see how they revived in the frosting. 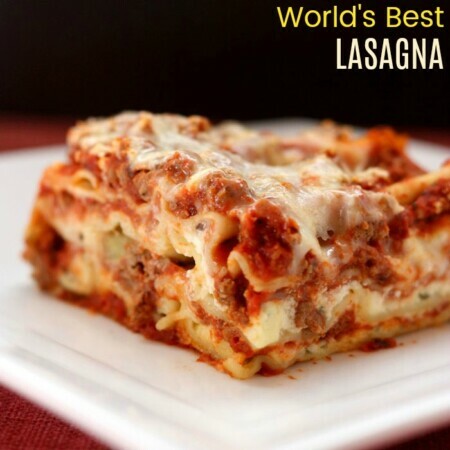 I am so happy you found my recipe and enjoyed it! I love the addition of cream cheese to the frosting. I bet the tang helps balance the sweetness. 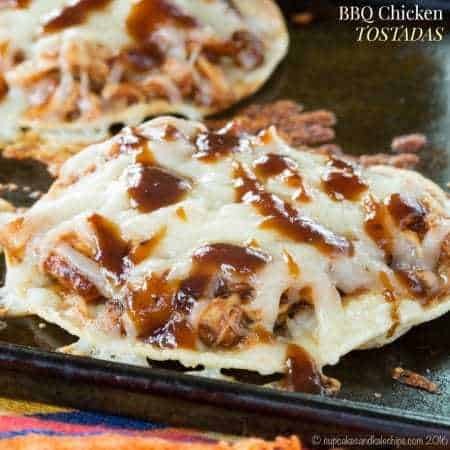 I just made these today, and they are absolutely delicious! Thank you for the fantastic idea! 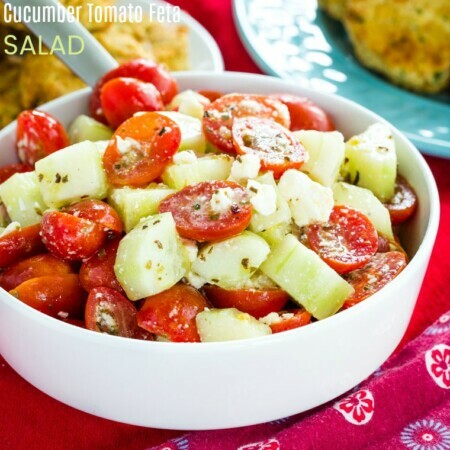 Oh, I get so happy when I hear of someone making one of my recipes, especially an older one. Thanks so much,. You made my day! Thanks! Not something I would eat everyday, but they were fun to play around with. Thanks for stopping by. Yeah, the generic cereal will do, but it still isn’t the same. I got my little guy the store brand “O’s” and they definitely looked a little strange. Rachel, I am heading over to join your Link party. I guess I am a day late, though. Me, Bill, Tyler, my dad, and the rest got sent to work with Bill so that I wouldn’t polish them off. Me, Bill, Tyler, my dad, and the rest went to work with Bill so that I wouldn’t polish them all off. I actually only had 1 1/2. I am making these for my students for Friday!! I’ll let you know what they think. Oh yay! Can’t wait to hear what they think! 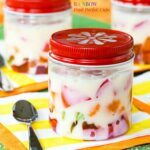 These look super fun and yummy! I think I went into sugar shock, just looking at them! lol. I was never allowed any sugary cereals….we had things like raisin bran and cheerios, and that’s it. I went nuts at friends’ houses! I think my fave was Fruity Pebbles at my friend Alison’s house–she always had those! Now, I don’t eat cereal at all, but Joe loves Kashi—it’s funny, there’s just as much sugar in some of those cereals, but he justifies it because it’s “natural.” Ha. Yeah, these are definitely not one to make often, but fun to play around with for St. Patrick’s Day. My cousin actually told me she wants Fruity Pebbles cupcakes after she saw these. I was never a big fan of them, but maybe I’ll have to come up with something for her. Wow, I might just have to go buy some Lucky Charms for my kids this week, they might not ever see them but it’s the thought that counts, right? I’m crazy about Lucky Charms and I love how creative you got! Thanks! It was a fun and tasty experiment!